(By Susannah Marley • Staff Writer Williamson Herald Click HERE for Full Article) Page High School senior Abbey Reed has been named Goodall Homes Student of the Month for April. A cheerleader since the second grade, Reed scored in the 98th percentile for the ACT and has achieved a 4.49 GPA. She was a cofounder of the Page High School Best Buddies Program as part of Best Buddies International, an organization that creates opportunities for one-on-one friendships and employment opportunities for people with intellectual and developmental disabilities. “I’ve known Abbey for four years,” Page High School guidance counselor Jim Mahan said. “Every year, she’s surprising us with more accomplishments.” “I’ve been in Williamson County Schools for 22 years and she’s probably in my top five most accomplished students,” Page principal Shane Pantall said. 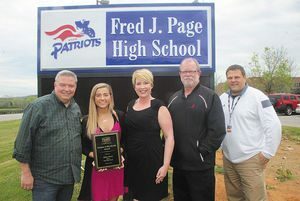 “Inside and outside the school, she’s a great representative of Page.” “Abbey has always been a big encourager of others and has enjoyed the camaraderie of cheering and being challenged by others,” Abbey’s father Steve Reed said in his nomination essay for Abbey. “She facilitates the success of others. She works hard, stays positive, and encourages other teammates to do the same. She promotes an environment where every team member can achieve their goals.” “This is a big honor,” Abbey said. “It’s nice to know people notice my achievements. There’s a lot of stress to balance getting good grades, cheer, and other activities so is something that I’m proud of and helps me stay humble.” “Goodall Homes is proud to recognize students across Williamson County who have made contributions to the community and for being, above all caring, energetic and positive role models for other students,” Goodall Homes Director of Marketing Rachael Overall. “Abbey recognizes that it’s important to give back to her community in addition to focusing on her schoolwork … we are pleased to recognize Abbey Reed as the Goodall Homes Student of the Month.” To nominate a Williamson County student, click here to visit www.williamsonherald.com to find a Goodall Homes Student of the Month for a form under the home menu.